Semasa meronda-ronda di facebook sebentar tadi, Admin tertarik dengan komen seorang pengguna FB tentang siapakah sebenar Rohingya. Sebagai seorang manusia kita tidak lari dari sifat simpati kita terhadap mangsa kekejaman yang dilakukan terhadap mereka yang tidak bersalah. Biar juga dari sejarah ini mengajar kita sifat toleransi terhadap sesama manusia, hormat menghormati diantara satu sama lain biar perpaduan itu terjalin. Jangan sekali kita menindas orang lain demi kepentingan pihak kita. Sekarang kita dihebohkan berita bahawa kekejaman yang dilakukan terhadap penduduk Rohingya. Menurut beberapa sumber yang admin baca kekejaman Tentera Junta dan penganut Budha di Myanmar ini adalah misi membalas dendam. Jom kita sama baca komen dari seorang pengomen iaitu Open-minded Rit Yit mengenai fakta siapakah Rohingya. Admin minta maaf ye.. sebab komen ditulis dalam bahasa inggeris takut terbelit lidah pula kalau admin translate ke bahasa melayu nanti..
Do you know what is the meaning of Rohingya? Rohingya means people came back from Rakhine. In fact, it was derived from the word "Roahing". Chittagonian Bengali used this word Roahing (also used as Rooine) to mention about Rakhine (also spelled as Rakhing) for hundreds of years since those Chittagonian couldn't pronounce correctly to talk about Rakhine. In the last century, a lot of Chittagonian Bengalis infiltrated into Rakhine State and they wanted to make themselves as local natives so that they created new ethnic group Rohingya, which means People came back from Rakhine. Hence, we can easily understand for those mentioned themselves as Rohingya are actually from Chittagong region and they are Bengalis. Here are the facts about Rohingya. 1. Rohingyas are not Burmese. They called themselves as Rohingya. There are no such people in Burmese history and census. 2. Rohingyas are in fact Bengali who speaks Bengali dialect, dress Bengali clothes and eat Bengali food and have Bengali cultures. 3. Rohingyas are illegal immigrants who illegally entered to Myanmar from Bangladesh. 4. The Burmese government gave citizenship to many Rohingyas, but more and more illegal immigrant Rohingyas comes from Bangladesh every year. 5. When they became citizenship, they are equal under the law. No one may be discriminated against on the basis of their race, religion, ethnic group, or gender. 6. Rohingya raped underage girls (under 13 years old), tortured them and killed these little girls. 7. Rohingya bullied Rakhine people, did several arson attacks, killed hundreds of Rakhine people and burnt thousands of houses. 8. Rohingya has been trained by fundamentalist Taliban and Al Qaeda (cited from wikileaks and other credible news). Myth 1. They cannot marry and have children. Government restricts them. Fact : Rohingya population extremely increases every year in Myanmar. The rate is higher than Myanmar population rate. How come their population increases every year? Myth 2. They have discrimination on religion. They don't have freedom of religion. Fact : There are many mosques built by Rohingya in Rakhine state. If they have restriction on religion, how come hundreds mosques in Rakhine state? Myth 3. They are so poor that they don't have anything to eat. FACT : The truth is they just want to get free money from UNHCR or organizations. They built a lot of nice houses and mosques. They bought a lot of guns and rockets. How can they build houses and mosques? How can they buy guns? Myth 4. Rohingya are not Bengali. FACT: Rohingya are in fact Benglai. Please check DNA. Please listen their dialect. Please research their language. According to the research, they are not Arab or Burmese ethic. How come they speak Bengali if they are not? Why cannot they speak Burmese if they are burmese. How can they wear like Bengali and have Bengali cultures. Myth 5. They are tortured by Rakhine people. Fact: There are many Rohingya in Rakhine state. Their population is more than Rakhine people population. Rohingya population increases every year and Rakhine population decreases every year. If they are tortured by Rakhine, they will run away from Rakhine state and they won’t be sticking around like a super glue. Myth 6: Rohingyas are so peaceful. Fact : Rohingya raped, tortured and killed Rakhine little girls. Rohingya bullied and killed hundred of Rakhine people. They burnt thousands of houses and dozens of Buddhist temples. How come the whole Rakhine towns and villages go to Ashes? Why are many Rakhine people killed by Rohingya? Myth 7. Government should recognize Rohingya as citizenship. Fact: Bengali government denied its own people. Burmese government accept them and gave them citizenship and equal rights. However, more and more Bengali Rohingya illegally enter to Myanmar every year. They are rude and aggressive. They don’t respect native Rakhine and bullied Rakhine people. Then, they pretend to be like poor and nice guys. Why did Burmese government have to accept these kind of rude hypocrite terrorists? Burmese government already gave out a lot of citizenship to these so-called Rohingya and they are equal under the law. Nevertheless, government cannot accept any more illegal immigrants since they don't do any good for Myanmar. 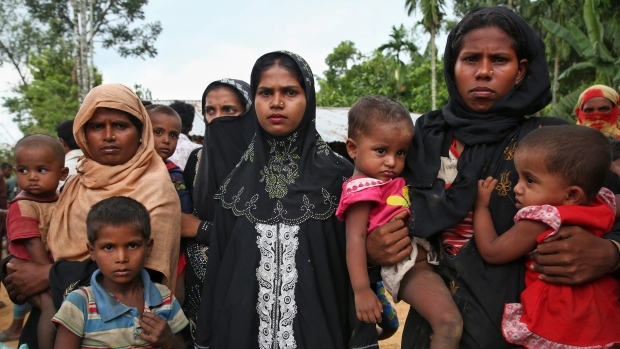 Myth 8 : Burmese hate Rohingya so much because they are Muslim. Fact : There are plenty of Muslim people in Burma. Burmese people treat with respect to those people who are not rude, aggressive and murderers. Burmese people treat with respect to those Rohingya who entered Burma legally, and who are not murderers. Rohingya are Bengali who illegally entered Myanmar and killed thousands of native Rakhine people. Government gave citizenship and equal rights to thousands of Rohingya. They built hundreds of mosques and thousands of houses in Rakhine State. Their population extremely increases every year due to illegal immigrant Rohingyas. They bullied, raped, tortured and killed native Rakhine people every year. In this case, they are systematically attacking Rakhine state and Rakhine people. They killed many Rakhine, and burnt thousands of Rakhine’s houses. They made over 30,000 Rakhine people homeless. They were trained by Taliban and Al Qaeda. Even though government gave citizenship and equal rights to many immigrant Rohingyas, their desires cannot be fulfilled. They want to make Rakhine state to become their state. They want to claim that they are native people. They allied with Taliban as well as Al Qaeda, and they want to kick Rakhine people out of Rakhine state. They want to govern Rakhine state as their own state.